We’ve all experienced it, that overwhelming desire to explore offroad, to go bush. There’s no doubt that for many the idea of turning your beloved van off the black top will have you feeling dazed, confused, lonely and vulnerable but it’s not all that daunting really. Preparation and a little knowledge is the key. 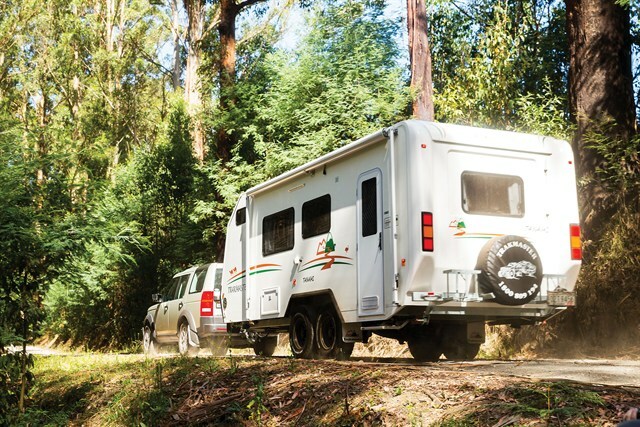 Do you have an offroad caravan like the Trakmaster Tanami? Assuming you brought a good offroad van just because it looked hardier than a blacktop tourer, well now’s the time to give it a go. You’ve got a good rigid van, with good clearance, dual axels with excellent suspension perhaps coils or air bags. The chassis of your van has a draw bar that extends along the full length under the trailer and not just welded to the sub-frame and the wheel track of the trailer matches or nearly matches that of the tow vehicle. Then there’s the brakes a quality electric braking system is not a bad start. Have a good look at your caravan. Make sure its got debris deflectors, checkerplate protection and stone deflectors. Keep an eye on tyre pressures; you need to adjust them for different driving environments. Getting this right helps keep your pressure down. Then there’s the safety gear – although that’s a whole other yarn – the bottom line is have it. Safety gear includes smoke detectors, fire extinguishers, radio and phone communication, ample water and food and recovery equipment and a good torch. The only thing you don’t need to learn how to use properly is the water and food – although that’s up for debate. You plan your route, organize someone to look after the cat, dog and goldfish, tell someone when and where you’re going, have the tow vehicle serviced, fueled and road ready and now it’s time to head bush. There’s not too much to remember while you’re plowing along a dirt road. Use high range 4WD, keep the speed down, avoid sharp movements, stay alert for livestock, stray animals and your dog that got out and followed you to Bourke. Now, you’re right, watch out for road trains, mud holes, dips, bull dust, loose gravel, pot holes dust, dust and more dust. The art here is to minimize hard braking, look ahead, gentle acceleration and if you must brake firmly do so in a straight line. If you skid, steer into it. Stop occasionally and feel the outback between your toes, catch your breath and have a cuppa. When all else fails – there’s nothing better than a good cuppa. Now if you’ve got a handle on all of that then remember – be careful. Drive safe and pick an easy route for your first experience with easy hills, less dust, no sand, and when the road’s dry. Not too much to ask is it? Just remember, this is not the half of it. There’s more. I just thought we’d keep things low key for the moment.